This is a close up of the hook-end-eye closure for the child's raincoat that I made for the Intel and OMSI Childrens Gift Exchange held during Christmas one year at OMSI in Portland. I had a self imposed rule that all the component parts of this garment were to be home made. 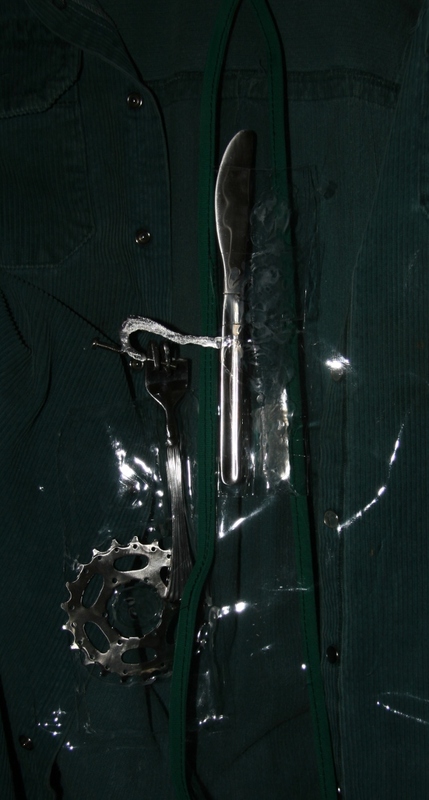 The fork and the bicycle sprocket were glue to the portion of the coat on your left while the knife and the hook were fastoned to the portion of the coat to your right. The prongs of the fork were bent over to to create the 'eye' in which the hook latches into to keep the garment closed.